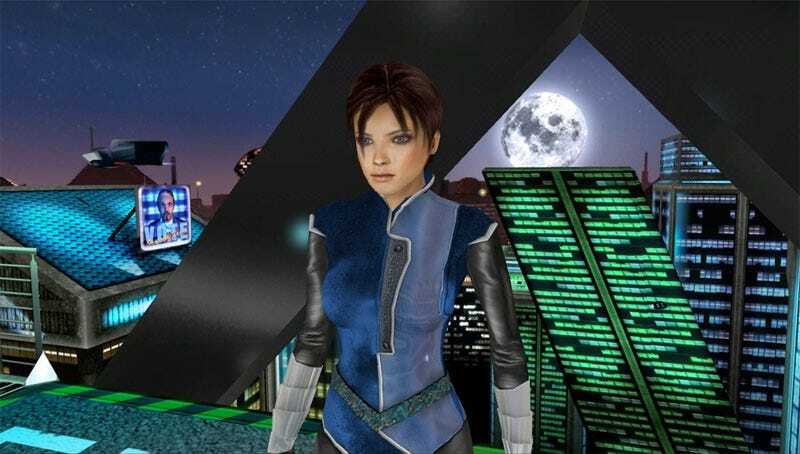 Rare's Nintendo 64 shooter Perfect Dark gets a high-definition makeover for Xbox Live Arcade, the lovely and talented special agent Joanna Dark looking ten years better than she did in her first-person shooter debut. Is Dark still "perfect"? Perfect Dark for XBLA doesn't attempt to modernize the decade-old original beyond improving its visual fidelity and taking the offline game to Xbox Live, a chance for players of the split-screen original to test their special agent skills online in competitive and cooperative modes. The 4J Studios-developed upgrade packs in everything the original Perfect Dark offered and more, a chance for the N64 owner to play through a full story-driven single-player campaign or whack nostalgic from the comfort of their couch or across the country. The console first-person shooter has evolved leaps and bounds since Perfect Dark first demanded Nintendo 64 owners plug in their Expansion Paks two generations ago. Is it worth going Dark one more time? Perfectly Quaint: Amidst the endless, detached killing of DataDyne soldiers and the run-ins with otherworldly lifeforms, the junk food blast that is Perfect Dark is still surprisingly fun to play. It can hardly be taken seriously anymore, with its outdated voice-acting and ham-fisted visuals—everyone in Perfect Dark is making a fist at all times—but that's what makes it so charming. The fluffy deathmatch, king of the hill and assassination modes fall under the "Xbox Live chaser" category of throwaway fun as does the opportunity to speed run missions for Achievements. Bang/Buck Ratio: There are few first-person shooters are Xbox Live Arcade, even fewer that offer something for the single-player fan, the multiplayer enthusiast and the something perfect for your four-player split-screen gamer. Perfect Dark HD is swimming in modes, maps, weapons and gadgets. Throw in Counter-Op mode, which lets players take control of enemy AI during campaign mode levels, and the option to burst through those same levels with multiple Joannas, and you've got yourself a deal at just 800 Microsoft Points. Nostalgia Bankruptcy: If you don't harbor fond feelings for Rare's Perfect Dark of old or even Goldeneye, as I don't, expect the appeal of the XBLA version of Perfect Dark to be easily lost on you. The game has its glaring faults, from laggy online multiplayer to a hilariously outdated cinematic presentation to floaty controls that feel out of place on a more precise game pad. Add in repetitive trial and error gameplay and bland compact level design, when judged by modern standards, and you may wonder why you're playing Perfect Dark instead of, say, Battlefield 1943 or Call of Duty Classic for your FPS throwback fix. First-person shooters rarely age well, as the Xbox 360 re-release of Perfect Dark helps to emphasize. The high-definition coat of paint can't obscure the now-antiquated mechanics and game design that wowed the game-starved Nintendo 64 fan looking for a Goldeneye replacement in 2000. But even for the first-person shooter fan without a shred of nostalgia for Joanna Dark and Rare's brand of run and gun gameplay, there's something undeniably entertaining about the game, even after all these years. Phone a old friend—or send them a game invite—and see how well Joanna has aged together. It might just feel like old times. Exactly like old times. Perfect Dark was developed by 4J Studios and Rare and published by Microsoft Game Studios for Xbox Live Arcade on March 17. Retails for 800 Microsoft Points. A copy of the game was given to us by the publisher for reviewing purposes. Played through single-player missions on Agent difficulty, tested all online multiplayer game types, dual wielded Klobbs to great success.